Recently, I've been having some more thoughts about a second edition of Border Reivers. Border Reivers was my first attempt at game design, and the 100-copy limited edition, entirely made by hand was the first step on the road to where I am today. I started designing Border Reivers after a 36-hour marathon game of Mighty Empires in which the guy who was clearly in the lead suddenly got knobbled after 36-hours and went from comfortable first place to languishing at the rear. Had he made a huge tactical error that brought such a reverse in his fortunes? Nope, some random dragon event just hurt him. Surely I could make a similar game that plays quicker and doesn't have such huge swings in power. My brief was to design a similar, civilisation-level, light wargame, with some development where random game happenings can't screw you completely. I wanted the game to play in 30-90 minutes too, not many people have 36 hours available for a single game. I'm still proud of my achievement with Border Reivers. With no experience as a game designer or publisher I managed to design a working game, get it printed, assemble 100 copies and sell them all within eleven months all over the world. Is it the best game ever? Clearly not. But it's one that I still enjoy when I play and people still ask me to re-print and one that Mal wants to play almost every time we meet up. There are several things about Border Reivers that I really like. I like the double-sided triangular land tiles that get flipped and upgraded as the landscape changes. I did get the alignment wrong on the coastal ones though, so flipping them was counter intuitive. I liked the aesthetics of triangular tiles and the way that it made movement not quite as expected - I envisaged this was due to the highland terrain making travelling in a straight line difficult. I also liked the brutal combat. The most likely outcome of a straight fight was everyone dies! However, there were substantial bonuses if you could get weight of numbers on your side. As a result, this led to either building large armies to crush your opponents, or risking everyone on a do-or-die attack. Of course, the cards spiced things up a bit too. Which brings me on to the cards. The cards in Border Reivers come in two varieties: buildings and strategies. The building cards were played face up, and gave a development advantage to one of your cities - either more income or better chance of getting cards/armies in each future turn. The buildings were ok, but the hidden strategy cards were more fun. There were only a few types, so when you got one, your opponents had a pretty good idea what they were in for. There was a defence for each of them, but the defences were pretty expensive, so you couldn't afford to keep defences for all possible cards in place. I really liked the hidden cards, especially: Insurrection, Reiving Party and Ambush. At the beginning of each turn you rolled a ten-sided die for reinforcements. You rolled twice for each city: once for army reinforcements and once for cards. Since you could build up to three cities, you could theoretically roll the die six times at the beginning of your turn. In addition, to make things even worse, the reinforcement buildings cards (you could build one of each in each city) gave you an extra die roll. Up to twelve in all! While I liked that these gave you the opportunity to gamble victory points (cash) for possible gain, you could spend 8 cash (a fifth of that needed to win) and still get nothing (it gave you a 90% chance of getting something, but a bad die roll and you're stuffed). I've played many games where you just need one more army to give you enough to attack. Roll for reinforcements... fail. Do nothing this turn except get more money and try again next turn. This is no fun. Border Reivers had two paths to victory, you could either kill all your opponents (player elimination) or save up enough cash. In two-player games it was about 50/50 over which path ended the game. In three- or four-player games it was almost always the cash route. Since the cash route could be achieved by building strong defences and then sitting back and raking in the cash the game was subject to turtling, where each player hid in their own little corner of the board and sat back trying to race to gain the most cash. This led to little player interaction. Mainly a problem with the three- and four-player games, but still doesn't make for a very fun game. I introduced the mine fairly late in development to try to encourage people out of their holes, but this was only a limited success. While the mountain range pieces in my first FIMO prototype (see picture above) were really cool, the rubbish card ones in the limited edition were definitely not. Each player is a particular Border Reiver clan, with different starting resources or player powers. Reinforcements are either free or fixed cost, limited only by the number of cities you control. Replace the victory conditions with a victory point track that could reward development, riches and aggressive play. Replace building cards with tokens or counters that show which city the building is in. My aim would be to reduce the number of turns when you've got nothing to do (either because your reinforcement rolls didn't provide the required reinforcements or you don't have enough resources to mount an attack) and reduce the huge number of die rolls at the beginning of each turn while still capturing the feel of the first game. Have you played the limited edition of Border Reivers? Would you like to get you hands on a copy? What do you think could be improved/changed? Answers on a postcard below please. One of the measures of business is sales growth. Especially with new start-up companies, where profit may be many years off, sales growth shows whether your business is working on a fundamental level - are you successfully selling your products/services and are you selling more than you did before? One of the difficulties of starting a business is keeping track of how things are going. When you don't have years of experience to call on how do you keep track of things? I've had a quiet few months from February to May. Is that normal? Is it a time of year thing? I can't really compare it to last year because during that period last year I was selling hand-made games or completely out of stock. Yesterday I tried to catch up with my books, which I've fallen a little behind on. 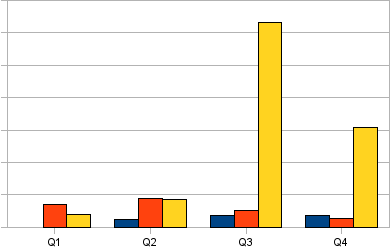 At the same time, I thought I'd start tracking a bit more sensibly how my sales are going, both now and historically. I knocked up a quick spreadsheet in OpenOffice Spreadsheet and started pumping my sales figures into it. In the above graph blue is my first financial year (hand-made Border Reivers), Red is my second (hand-made It's Alive!) and yellow is my third (first full-time year, It's Alive! reprint and Carpe Astra). It looks pretty good, but there are some things to take into account. For the first two years, I made games by hand, and sold mostly directly. These were short runs and so my sales were pretty small. Last year I started getting games made for me in larger numbers and selling mostly to distributors, hence the hike in sales numbers. My growth for the first quarter of last year was negative, seeing as I ran out of hand-made games to sell halfway through. The second quarter there was no growth, I had two months of nothing to sell, but It's Alive! turned up in September and that was as much sales (after tax) as I'd managed in the whole of the equivalent quarter the previous year. The next two quarters have a sales growth of 1100% and 1200%, but it's not a fair comparison, selling large volumes of professionally manufactured games to distributors as opposed to selling individual copies of hand-made games to gamers. The first quarter of this year will probably have growth around 750%, but the real test will be the next two quarters. Last year I released It's Alive! in Q2, this year I'll just have the residual sales on the three products I've got out. Q3 last year had: Essen, my best month's sales ever, the release of Carpe Astra and initial stocking orders from most of my European distributors. I'll have to do well to top that, and there's no chance of doing ten times better! We moved into our new house last Thursday. Thursday, Friday and the weekend were spent moving and trying to sort stuff out, Monday I was at the old house, cleaning and waiting in for three orders to be collected by the couriers. The first was an initial stocking order for my first Canadian distributor - yeay! They were one of three new distributors who have contacted me since I ran the competition on BoardGameGeek. The second (a new US distributor) has placed an order which I'm going to ship on Friday (I've had to wait until I can go to York to get more It's Alive! stock - I've sold through the pile I was keeping at home) and the third has only recently enquired. The second order shipping on Monday was a re-stock from one of my UK distributors. This was really gratifying, since they'd ordered less of Sumeria than they had initially ordered of It's Alive! and Carpe Astra, and three weeks later they had to ask for some more :-) I was expecting their sales to be slower since several of the larger UK shops had bought from me directly at or since the Expo, but this doesn't seem to have affected their sales much at all. Yet another US distributor has also enquired in the last couple of weeks. This third new distributor is even better since a Danish/Norwegian distributor I've been talking to for months told me a while back that if I dealt with PHD they would buy my games from them, rather than me directly. So, if PHD also sign up, that will be two new distributors for the price of one :-). I don't know whether they will bite yet, but so far so good. On top of all that I spoke to another distributor today on the phone. He's going to start soliciting my games. Hopefully this will lead to them picking them up, but it was effortless to get him to consider it. I'm feeling pretty positive at the moment. The new house is lovely, and has a nice big office that I can store things in much more tidily than I could at either of our previous places. Feedback on Sumeria has been pretty good so far and June's sales will be my second-best ever (out-stripping January, the previous holder of that title, but not a patch on last October and Essen :-) ). The only fly in the ointment is that most of my European distributors have yet to place a Sumeria order, so European availability is pretty patchy. On Saturday, I did the first of what I hope will be many 'Demo Days' where I visit a store and spend the day teaching customers my games. I didn't do much in the way of preparation, obviously I arranged it a few weeks in advance and mentioned it in the 'Events' section of my website, but that was about it. In hindsight, I should have put in a bit more effort. The shop (Inner Sanctum Collectibles in Cambridge) had put up posters, and a window display and had been telling their regular customers about it, but I should have mentioned it here, on BoardGameGeek and Twitter to give it as much publicity as I could. In addition to leaving my personal copies with them for a week so the staff could learn the games I also brought along a couple of boxes of each game to ensure they didn't run out of stock. The shop's Saturday opening hours are 10-6, but they are usually pretty quiet at the end of the day so they had been advertising I'd be there 10-4. In the end I had to head off about 5 since The Wife and I were going out for dinner with some of her colleagues that evening. Cambridge is about an hour's drive so I headed off at 8:30am to ensure I wouldn't be late. I ended up getting there about 20 minutes early, which gave me a chance to set up before the shop opened at 10. The first hour was pretty quiet, which gave me a chance to teach Carl, one of the staff, It's Alive! and Sumeria. There were some telephone enquiries about my visit (so someone was interested at least) and by about 11:15 the shop started filling up. Apparently it was a fairly quiet day for them, but my games were in use pretty much all day and were very well received. Several people wanted to play all three games, and several people wanted to play games twice (or more!). The shop did a deal where customers got 10% off all of my games that day, and if they bought all three they got 15% off. I was surprised (but gratified!) at how many takers they had for the all-three deal, and at the end of the day, despite not having sold all their current stock (most of it had gone) they kept one case of each game, which I invoiced them for that evening. The games well very popular (especially Carpe Astra and Sumeria), and lots of their customers bought them. I can only hope that they get played a lot and this leads to more sales for the store (and hence for me in the long run). I think the deal helped (I could inform people of the deal for today only, which led to more sales on the day I'm sure), and being there to teach people means they get the rules right first time, which is always a good thing. When I play a game for the first time I often get a rule wrong, and this can lead to a bad first impression. Inner Sanctum was a great venue, not only do they have a great range of games (board, card, miniature and collectable) but they also have a lot of space for playing. I co-opted three tables (one for each of my games) and that still used up less than half of their table space. In addition to a light, airy well-lit space with plenty of room for the games, the staff are very friendly, and they plied me with food and drink throughout the day (including a run for doughnuts to celebrate one of the customer's birthdays!). After a weekend of decorating and then another at the Expo, I would have really liked to take Saturday off, but it was a very valuable use of my time. Not only did I cement my relationship with one of the biggest shops in the UK, but I got my games into the hands of a lot of gamers, who really enjoyed them. Getting your games onto shelves is one half of the battle won, but until you actually have happy customers playing the games and spreading good word of mouth, that's where the games will languish. Good relationships with shops really help, since the shop staff will suggest your games to people who aren't sure what they want. Definitely a good use of my time. There's a point during the lifespan of any successful company when you go from initial struggles to comfortable success. I'm not there yet, but there's some promising signs for the future. At the UK Games Expo I introduced myself to Zev Shlaslinger, the man behind Z-Man Games in the US. Z-Man have made it, they have critical mass. They have a large portfolio of games, including the English version of the extremely popular Agricola which is currently number one on BoardGameGeek. I introduced myself as Jackson Pope, of Reiver Games, expecting a polite 'who the hell is this nutter?' smile. Instead, Zev replies: "I know who you are - I read BoardGameGeek and your blog". Wow! That was unexpected (hi Zev!). At the bank this morning, my business specialist was also very impressed with my progress in the six months she's known me. Apparently, at the moment most of the people she sees are really struggling, and while my company has yet to pay me a penny, things are going pretty well. I've sold a lot of games and I've got some money coming in every month. At the moment the company is still in an early cycle. When I bring out a new game I expend a lot of money getting it produced and then it takes a long time to recoup. Doing print runs of a few thousand means my costs per game are pretty high, so I don't get quite as good margins as I should in an ideal world, and the games are slightly more expensive than the larger print run competition. When I've recouped enough money, instead of paying myself, that money is immediately re-invested in producing another game. While I'm at this stage if any of my games are a flop I'm stuffed, I won't get the money back to get another game done. When will I have critical mass? It's hard to say. If I can get 6-12 games in my portfolio then the residual income from those should be enough to keep me going. A bad decision need not be fatal. Also, with more games I become a more attractive supplier for distributors. Being able to place a reasonably sized order to get shipping discounts is only achievable if they can guarantee to sell the games. Taking 500 copies of a single game (one pallet of Carpe Astra or Sumeria is 504 games) is a big risk, but taking 50 copies of 10 games is much less so. So in essence all I need to do is keep picking games that turn out to be popular until I've got lots on my books. I've got 18 distributors now, mostly in the US and Europe, but a couple of further flung ones too. I'm cautiously optimistic that I'll be picking up two more in the next couple of weeks, another one in the US and one in Canada too. The distributor treats each line as a completely separate item. When you release a new product they will place a 'standard' order of a certainly number of cases (in my experience 4-15) of the game. When they start to run low they'll reorder, with the volume of the second and subsequent orders based on the rate the first order sold at. The distributor groups all of a supplier's lines together. They will place orders fairly regularly (maybe monthly) ordering a mixture of all your product lines, based on current stock levels of each game. 8 boxes (48 games) of It's Alive! Having games that are the same size like Sumeria and Carpe Astra is great as it makes filling shipping boxes that little bit easier for the second class of distributor. I can see that Twitter will be quite useful - I shouldn't have dragged my heels about opening an account for so long. It allows me to blog when I'm away from my computer - at conventions and trade shows for example. Also, I often end my Blogger posts with an 'In other news' a short bite of information that doesn't warrant a post on its own but that I hope will be of interest to someone. I figure I can also break the weaker 'this is what I did today' posts down into bite-sitzed chunks for Twitter. In my mind this allows me to use Twitter as designed - to let you know what Reiver Games-related stuff I'm up to on a more frequent and more concise basis. 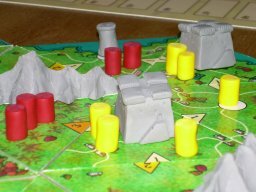 At the same time, I can strip out what I consider to be the weaker posts here, and instead stick to the meatier stuff: my thoughts and experiences of running a board games publishing company. So hopefully the posts will be more interesting and more useful to those of you in a similar boat, though as a result they may become slightly less frequent (since a 'this is what I'm doing' filler post is less likely to appear). What are people's thoughts on this? Am I barking up the wrong tree or does this sound like a good idea? Ok, enough faffing, I've finally joined the Twitterati. If you think I might have something interesting to say you can follow me from the link to the right. If you think you have something interesting to say leave me a comment with your username on Twitter and I'll follow you. After a couple of days that have been spent mostly in the car in sweltering weather (for the UK, so about 23 degrees!) I'm now at home for the day. I've got most of my pre-orders shipped, except for those that are being collected at the UK Games Expo this weekend, and today is a stocking order day. Six of my eighteen distributors have placed orders already. Two are collecting at the Expo, three are going out today and one is amending their order so that it better fits in shipping boxes. This was something I didn't realise I could do. When they send me a purchase order telling me what they want to buy, I get back to them and tell them how to amend their order so that it fills shipping boxes. Since it's an American customer paying in USD, and I pay shipping this is quite important to me. I'm going to chase my other distributors now the games have arrived to see if they want to order, hopefully I can get a few in time to ship early next week. The stocking order process is fairly complex. First I send them some information to solicit with their customers and then hopefully they send me a purchase order, expressing an intent to buy a certain number of games. There's often a lot of chasing between those two steps though! In return, I draw up an invoice for the sale which I send back to them. I also need to keep a copy of the invoice for my records, and record the invoice in my VAT Account. I then need to arrange a courier collection for a day that I'll be in. I use Interparcel Ltd. as a courier aggregator. Couriers are expensive. However, if you do a high volume of business with them (usually tens of parcels every month) then they will start to discount the rate you are charged for the shipments. I tend to go through periods when I send 10-15 parcels over a few days and then very little for the next several months until my next game comes out. Courier aggregators like Interparcel work by dealing with lots of couriers and lots of customers. With lots of customers, they get a great rate from the couriers and can pass that discount on to their customers minus a small percentage for themselves. With lots of couriers they offer several options for each parcel and you can choose to send each parcel with whoever is cheapest (generally DHL for UK and Europe and UPS for everywhere else). The receipt needs printing out and adding to my records and my VAT account. When I go to York to get games I also tend to get a few shipping boxes at the same time. These bigger boxes (51cm x 41cm x 42cm) can hold 8 boxes of It's Alive! (22 Kg!) or 4 boxes of Carpe Astra/Sumeria (15Kg). I get the boxes flat-packed from Zetland Boxes, so on shipping day I need to build the boxes, fill them, attach the labels and the wait for the courier - who is often early, so the preceding steps are generally done early in the morning to ensure I'm ready when they arrive. Shipments going outside the UK also require me to provide proof that they are leaving the UK (for VAT purposes) so that I can zero-rate the purchases, which generally means keeping a copy of the courier's airway bill with the invoice. Shipments going outside the EU also need four copies of a customs invoice, detailing the contents and their value which all need to be signed and given to the courier when he arrives. It's a complex process with lots of little steps, I have to be quite methodical to ensure I don't forget anything. In other news, It's Alive! has finally sold just over half the print run, two days before it's nine-months old. That seems pretty good to me, but admittedly I don't really have any idea! I've just had confirmation that Sumeria arrived at the warehouse on Friday.